This original pastel painting is available. To enquire or order your dog, cat, horse or small domestic animal pet portrait from photo, image or picture, please contact the artist. approx. 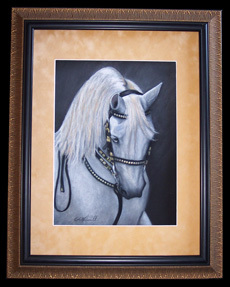 size: 9" x 12"
When I heard that the World Famous Lipizzaner Stallion Show was coming to town, I had to take my daughter to see it. It was a surprise birthday gift for her and also a perfect opportunity for us to take reference photos of these noble horses. We were both mesmerized by the performance while trying to capture as many images as we could. 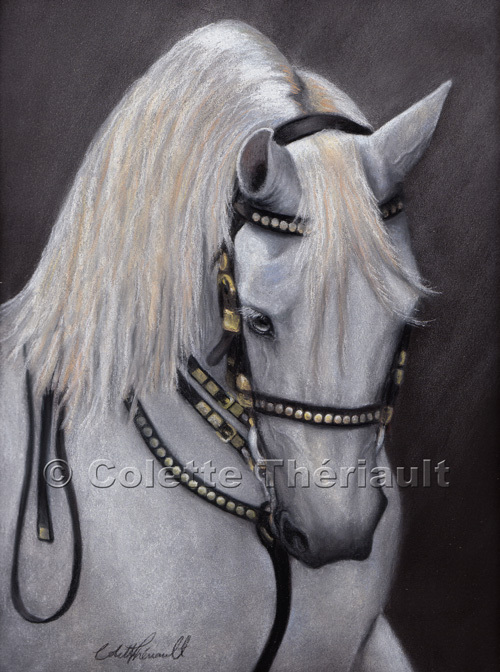 This pastel painting is the first in a series of Lipizzaner portraits. This majestic "horse of battle-horse of ballet" is one of the most magnificent and graceful of horse breeds. 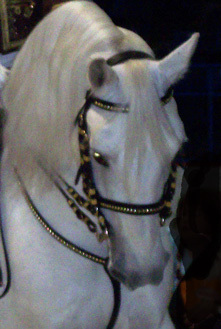 It is also one of the rarest; renowned worldwide as the dancing, prancing or waltzing horses. The spectacular leaps and maneuvers were once used by riders in saddle to protect and defend themselves on the battlefield. Viewing the Lipizzaner stallion and his rider perform to a symphony of music is like stepping back hundreds of years and seeing the greatest equine ballet in history.